I recently received a sample of Pacific Natural Foods Organic Pho Soup Base and Tortilla Soup Base. They are holding a Creative Chef contest. For more details click here. The very day I got the samples in the mail, I had no idea what I would make for dinner. 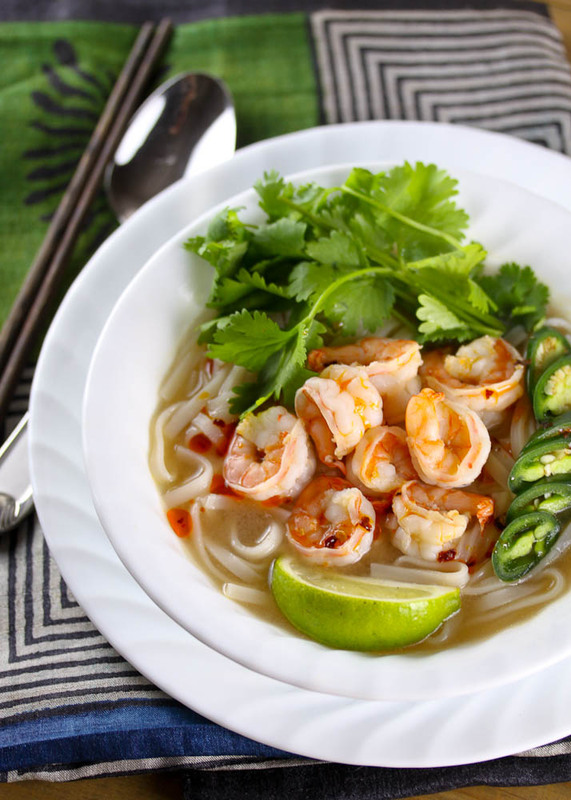 I opened my pantry and refrigerator and gathered ingredients I already had: frozen shrimp, ginger, garlic, cilantro and jalapeños from the fridge, and rice noodles and chili oil from the pantry. The results were fantastic! The soup base has a rich and complex flavor, so you really don’t need to add many extra seasonings. Stay tuned for a recipe for the tortilla soup base, coming soon. Do you have ideas on how to use these soup starters? You can enter the contest by submitting your recipe by October 31st. Details here. 1. Place shrimp in a medium bowl, season with salt and pepper. Add in the grated ginger and garlic clove and stir well. Cover and keep refrigerated until ready to cook. 2. 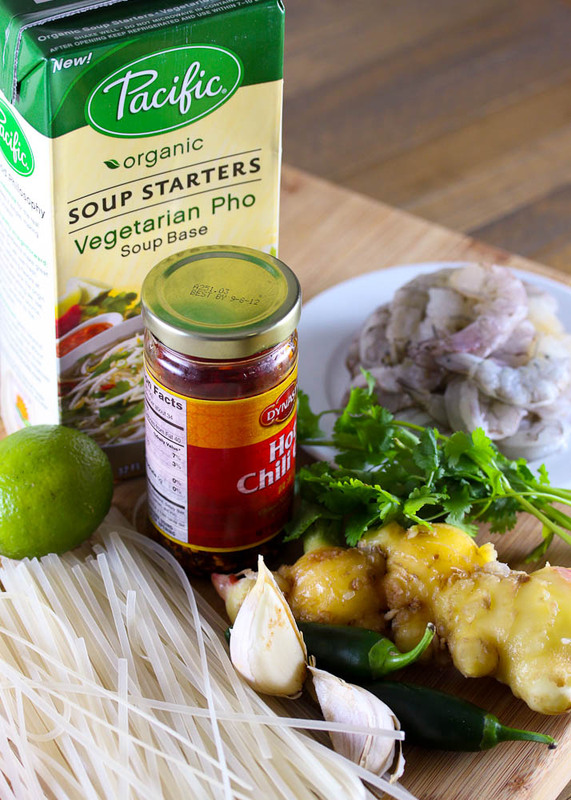 Place the Pacific Foods Vegetarian Pho Soup Base in a medium pot and bring to a simmer. 3. Once the soup base comes to simmer, add in the shrimp and cook until they are fully cooked. Add in the noodles and the lime juice. Taste and adjust seasoning. 4. Serve in 4 bowls, and garnish with sliced jalapeños, lime wedges, cilantro, and drizzle with chili oil. Disclaimer: Pacific Foods sent me samples of two soup starters to experiment with. I received no remuneration for this blog post. All opinions are my own.